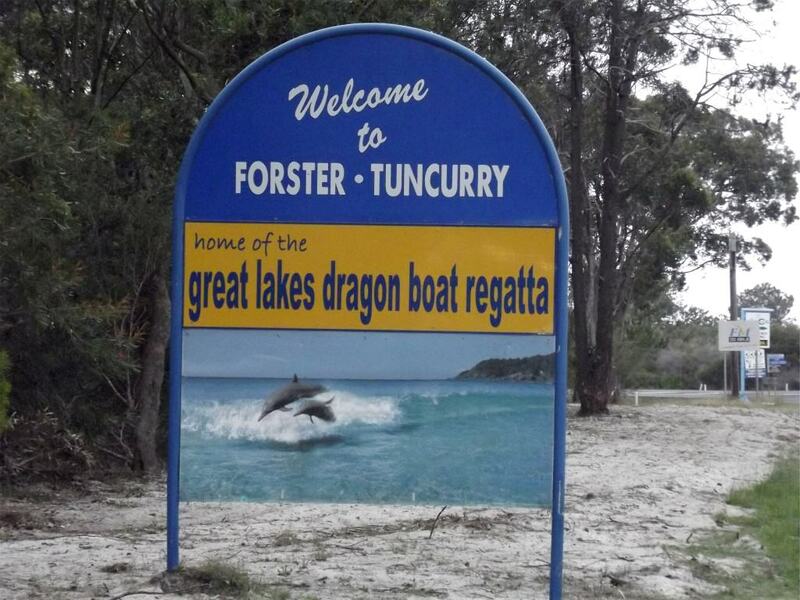 The twin towns of Forster and Tuncurry on the New South Wales mid-north coast are said to be the beating heart of the Great Lakes region. Nestled between Wallis Lake and the Tasman Sea and surrounded by National and Marine Parks, it is little wonder that they are one of the state’s premier holiday destinations. We set off on a slightly overcast morning to spend a few days here and see what all the fuss is about. 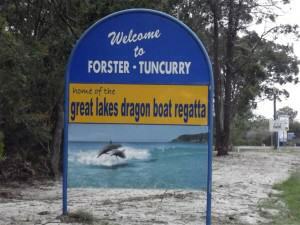 The town of Forster was originally called Minimbah but was renamed in 1870 after William Forster, the, then, Minister for Lands. 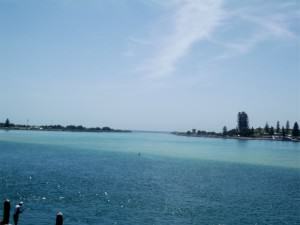 Tuncurry is an Aboriginal word meaning “plenty fish”. John was hoping the name had real meaning! There’s a vast array of accommodation in Forster-Tuncurry to suit all tastes and budgets but for us it had to be a tourist park so we checked into the Smugglers Cove Holiday Village ([star][star][star][star][star]). What a fantastic place this is! Our first 5-star park! It had absolutely everything that you could possibly want in a holiday destination, from tent sites to cabins and a range of activities to make your stay the best you could have. You could have a terrific holiday without even leaving the village! The park has a nautical theme, is situated on the banks of Pipers Bay but still almost in the heart of town. The slight overcast was now heavy and a light misty rain had started to fall so we got camp set up pretty quickly. It didn’t look like the rain was going to get any worse but you never know. 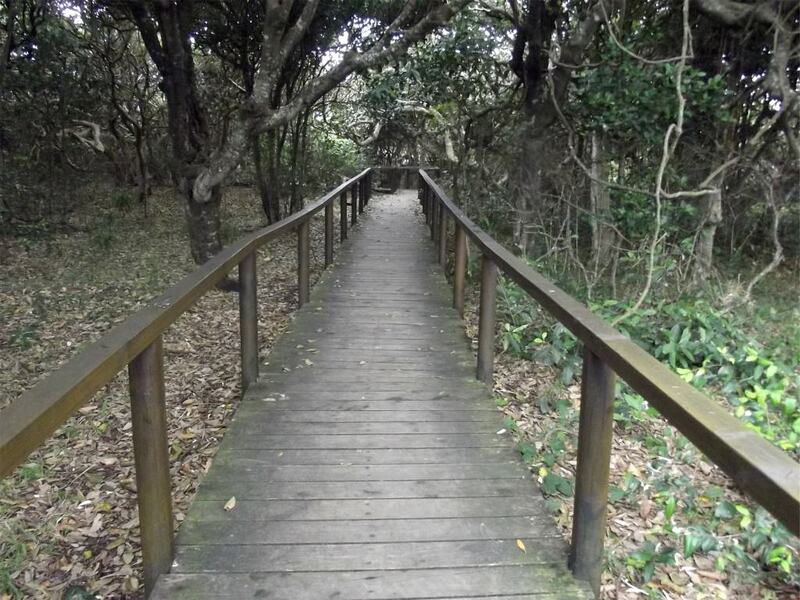 Only 10 kilometres (6 miles) south of Forster is the Booti Booti National Park, consisting of an 8 kilometre (5 mile) peninsula between the Pacific Ocean and Wallis Lake. The name comes from “butibuti”, an Aboriginal word meaning “plenty of honey”. At the northern end of the park is Cape Hawke Lookout, overlooking Cape Hawke, a coastal headland within the national park. The headland was named by Captain Cook when he passed it in 1770. It is only 420 metres (1378 feet) from the carpark to the summit and lookout and I wanted to have a look. After our trek up to the lookout at Wineglass Bay in Tasmania you would think I would learn, wouldn’t you? 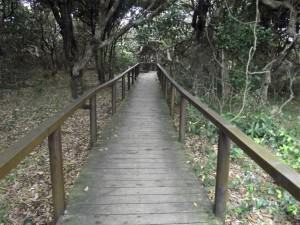 The walk took us through some stunning littoral rainforest with lots of stops along the way, and not just for photographs, before we reached the top. Was it worth the climb? Not at that point but the best was yet to come. The vegetation at the summit had grown so high that in order to see the view you would need to be about 10 feet tall but the National Parks and Wildlife Service had erected an 8.4 metre (27½ feet) tower that offered a 360° view of the surrounding area. Up there you really are at the top of the world! They say that on a clear day you can see as far as Barrington Tops, approximately 100 kilometres (60 miles) to the west, and Crowdy Bay National Park, approximately 60 kilometres (37 miles) to the north, and what a brilliant place to do some whale watching! But today the overcast made the view less than optimal. It wasn’t terribly good at all. 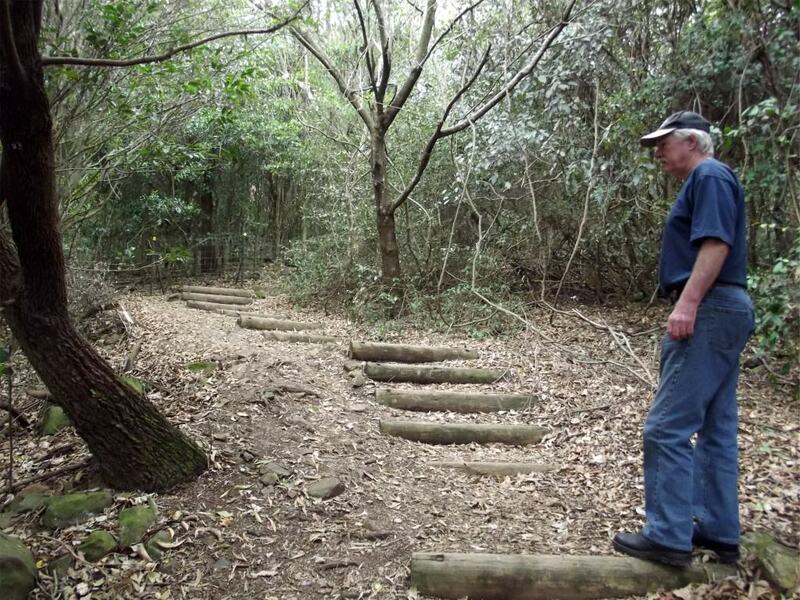 There is a memorial on the summit declaring its discovery by Captain Cook and also a Central Mapping Authority Geodetic Station. He had to be kidding! By now the rain was really starting to fall and the afternoon had become miserable so we decided to make our way back towards camp. Along the way John discovered what looked like an off-road track. 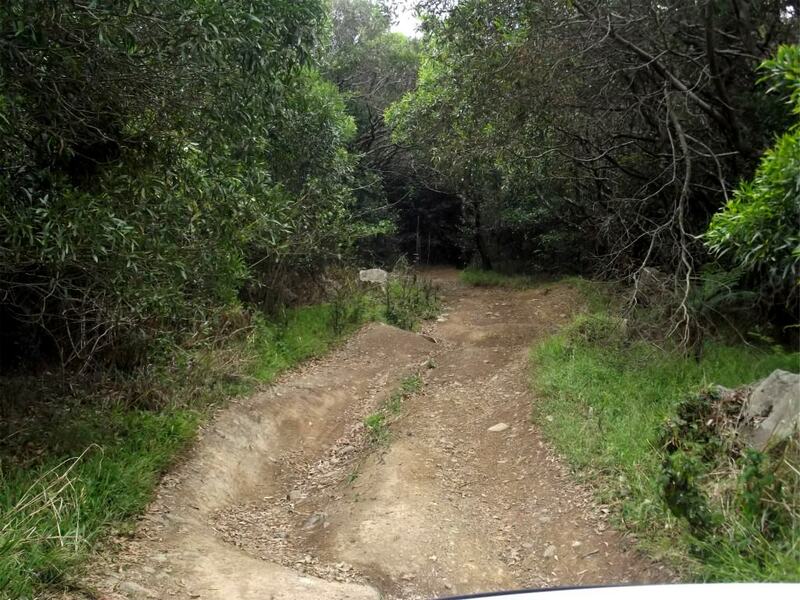 It was off the road and it was a track; there was nothing more you could say about it. There was no way we were going on that! There was much discussion, mostly with me saying that he was out of his tree, and he was the recipient of “the look” more than once, but finally common sense prevailed. He was sorely tempted, though. this was the best time and place to fish. Not that I needed that much convincing; I was feeling a little guilty about putting the brakes on his off-road plans. So we settled in on the beach but it wasn’t long before the rain started again and I went back to the car. It must have been pretty miserable out there for him but he persisted. Sometimes he catches the best fish in lousy weather but today it wasn’t to be. He wasn’t too dejected as we made our way back to camp so it looks like we’ll be having another fishing excursion while we’re here. The weather didn’t look like clearing at all that evening and it was even too miserable for first night bubbly! 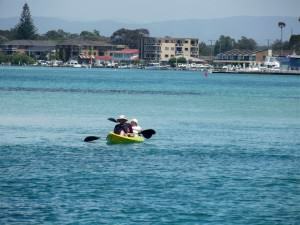 After a night of intermittent showers the sky was clear the next morning and I was looking forward to a cruise on Wallis Lake aboard the Amaroo, Forster-Tuncurry’s premier whale watching cruise. Not that I expected to see whales in the lake but I hoped there would be a dolphin or two. With blue skies and the sun shining it looked like it was going to be a good day. Unfortunately, it was windy and the water outside the lake was rough. Our skipper informed us that we wouldn’t be crossing the bar and going “outside” this day, we would have to stay inside the confines of Wallis Lake for safety’s sake. We departed the wharf a little after 10:00 and cruised around the lake passing oyster leases, for which the area is famous, Wallis Island, and Regatta Island. John mentioned that he’d forgotten his fishing rod and earned a look of disapproval from one of the crew! around the lake, and enjoyed morning tea aboard, the vessel made its way out towards the bar and that is where we saw what we came to see. 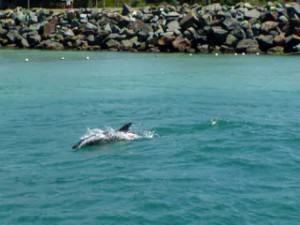 No, not whales, the next best thing, dolphins. Such beautiful and graceful creatures, they frolicked in the waves and actually “surfed” across the bar. Space at the side of the boat was at a premium and cameras were clicking madly. But all too soon we were back at the wharf and our cruise was over. We had a great time and I would thoroughly recommend it to anyone visiting the Great lakes. 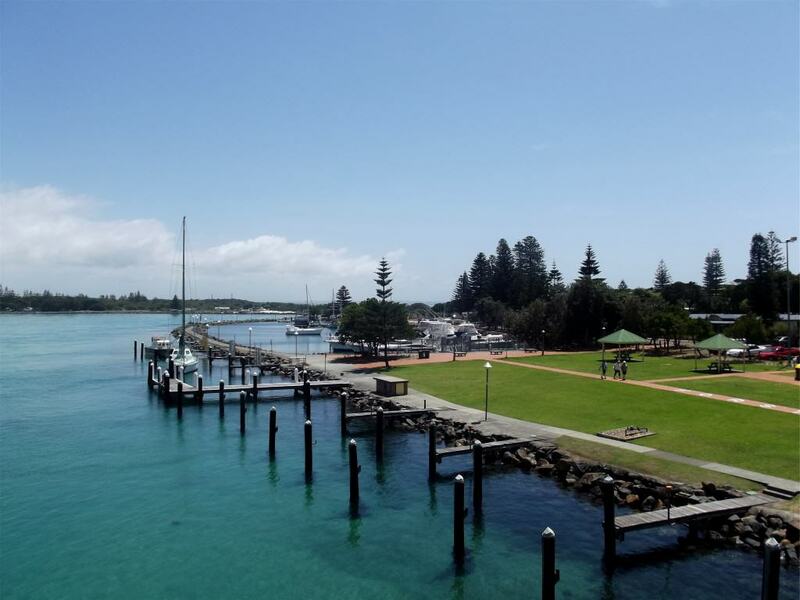 Forster-Tuncurry is full of places to eat, from coffee shops to cafés to restaurants and the hardest decision we had to make this day was where to go for lunch. 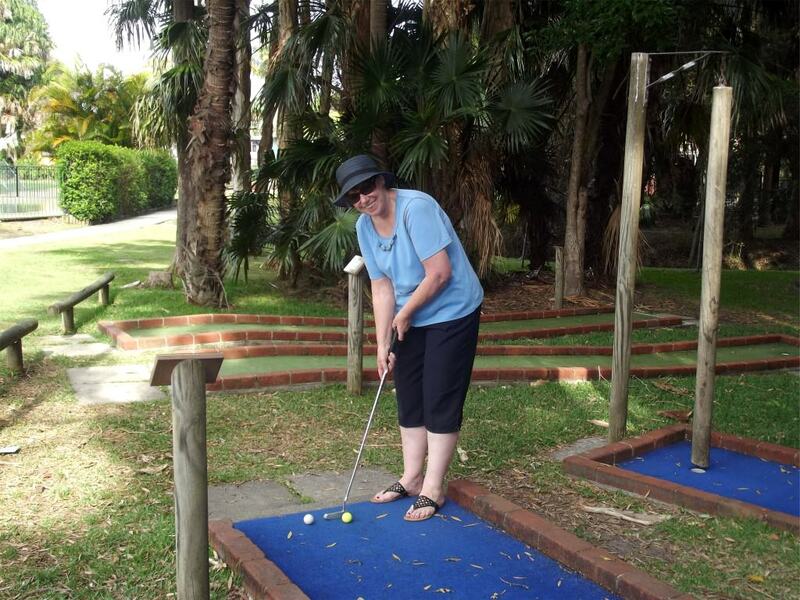 We opted for Sporties, a sports club in Tuncurry, almost at Tuncurry Beach. The lunch, though nothing fancy, was good and very reasonably priced. Afterwards we drove around to the Rockpool, a netted safe swimming area where there were a few people making the most of a beautiful day. 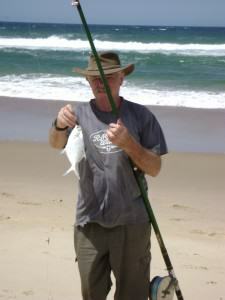 And the Rockpool just happened to be where the Tuncurry breakwall is and that was good enough for John. The fishing rod came out and that was the end of the afternoon. We wandered out along the breakwall but there seemed to be a lot of people there and it was a bit crowded so we went down onto the beach. I settled in with my book and John cast his line. It wasn’t too long before he had a bite and he reeled in a little dart, the first of many such fish, 6 in all. Unfortunately there was nothing bigger that afternoon and, knowing there was a bottle of Two Tails waiting for us, we didn’t stay long. It was barely an hour and a half before we packed up and headed back to camp. Still, 6 fish in an hour and a half wasn’t a bad afternoon’s work. But it was still early in the afternoon and Smugglers Cove offers so much in the way of entertainment and activities that we thought we might like to spend a little time in the park. way either of us would beat him would be if he was too busy laughing to play! But it was fun and some of those obstacles were . . . different. 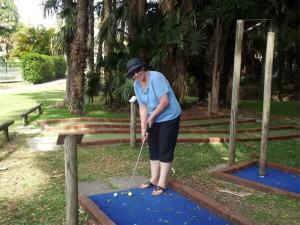 It was like no golf course I had ever seen. Later we wandered around the park for a while, visited Peglegs, the entertainment room, took a stroll down to the lake where there were some swans serenely floating on the water, a few people fishing, and the odd canoe and finally wandered back and perched ourselves beside the pool with our bottle of Two Tails Sparkling Wine. It’s here that I should say it was a perfect end to the day but you can’t come to this holiday mecca and not sample at least one of the restaurants in town. The folks at the office recommended a number of restaurants in town, there was almost too many to choose from and so I left it up to John who decided he wouldn’t mind Mexican. So we set off for the Aztec Restaurant. Not a large restaurant but pleasant surroundings, friendly staff, and great food. What more could we ask? Although we did discover that just because something has an interesting name and the waitperson says it’s not THAT hot, that we really shouldn’t order it! Interesting or not, I thought my mouth was on fire and fully expected that my stomach lining would melt! But, in spite of that it was delicious! 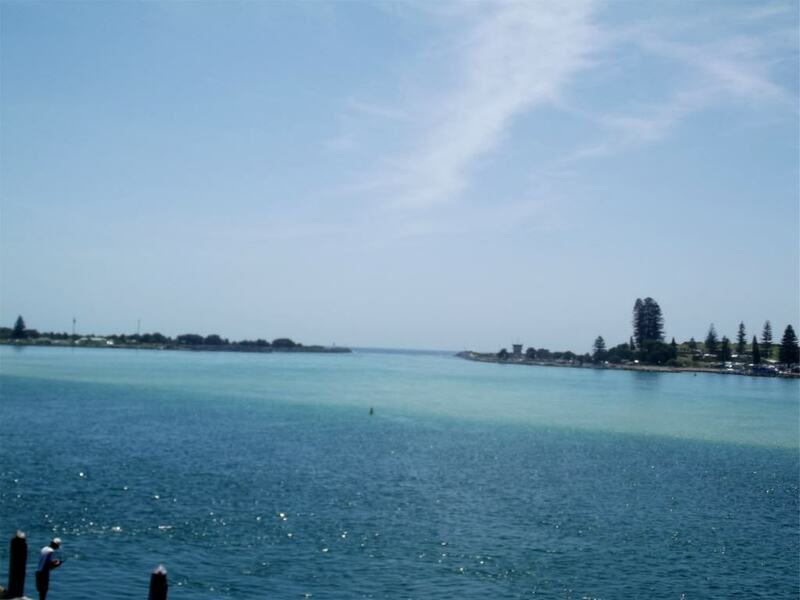 And so we came to the end of our break in Forster-Tuncurry but there was so much more to see and so after packing up the caravan we drove down to Wallis Lake and went for a walk along the boardwalk. Wallis Lake is 25 kilometres (15 miles) long, 9 kilometres (5½ miles) wide, and is fed by four rivers. The lake is famous for its seafood, particularly the Wallis Lake Oysters. The boardwalk begins in the Forster marina. 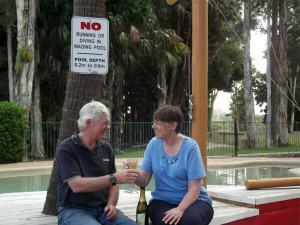 We followed the path around the lake, past a public wharf, cafe’s and restaurants, to Little Street and the dock where the Amaroo is moored. The path does continue on a little further but I wanted to see more of Tuncurry on the other side of the bridge. in parts that if anyone had fallen off they would simply have had to stand up and walk to the shore! The ferry was used for 37 years, with the last one being able to carry 6 cars, until the bridge opened in 1959. The bridge is 631 metres (2070 feet) and is one of the longest pre-stressed concrete bridges in the southern hemisphere. 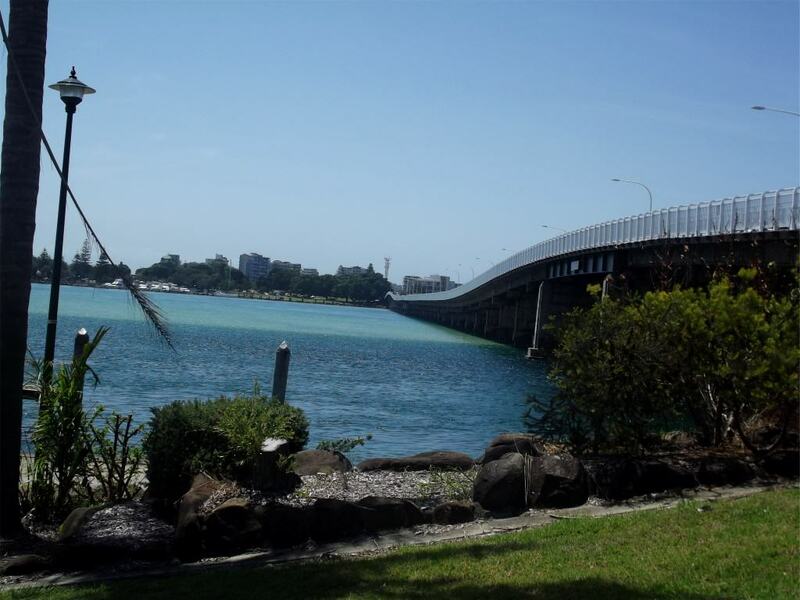 We crossed the bridge on foot and made our way into John Wright Park on the Tuncurry side where we found a wonderful expanse of green grass and an amazing view out across the bar to the ocean. John Wright was a boat builder in Tuncurry in the early 1900’s and it is said that he was the founder of the town and the ship building industry there. He built a wooden vessel called Tuncurry in 1903 and she was used to carry general cargo between Sydney and Brisbane. 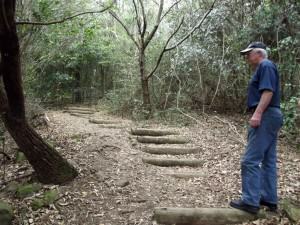 She was lost off Barrenjoey Head near Sydney in 1916. 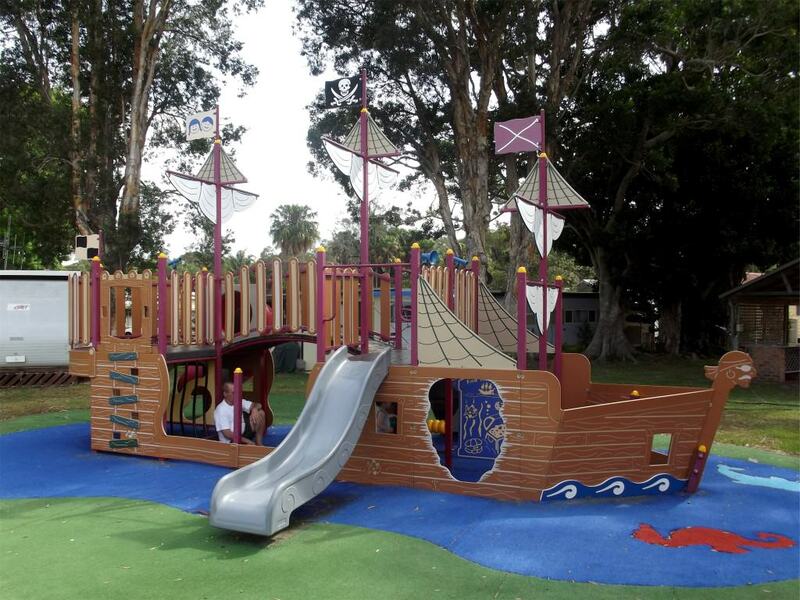 The park is on the land where the original ship building business and adjacent slipway stood. John Wright’s house, called Tokelau, still stands today. It was time to move on. John was a little concerned about where we had parked the car and he wanted to make sure all was well and that we didn’t have a parking ticket. There’s plenty of parking around the parks on both sides of the bridge but not necessarily for a 4×4 with 18-foot caravan attached! 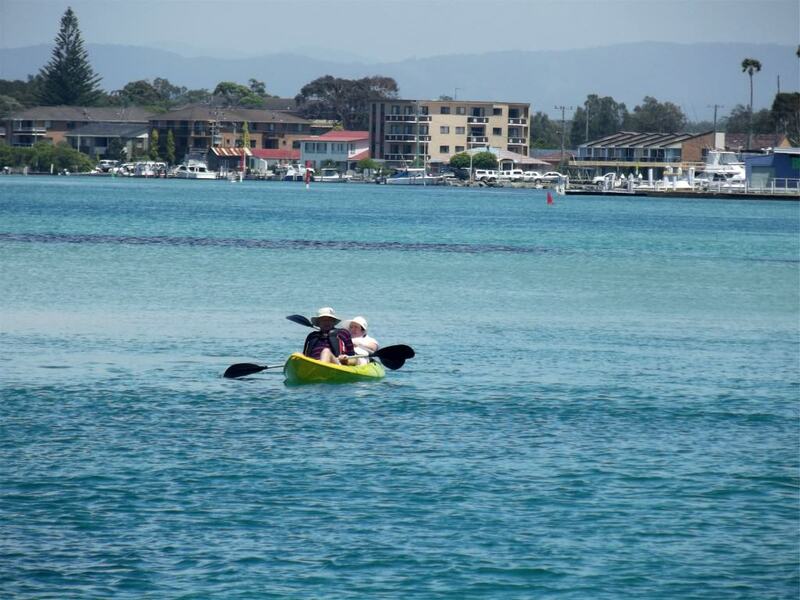 We were soon on our way and heading off down the Pacific Highway to our next adventure but I know we’ll be back because there is so much more to see and do in Forster-Tuncurry; a couple of days there barely leaves a ripple.